It’s time for the annual Failure Fest when the wise men pontificate on PISA , floor targets and the Ofsted annual report; justifying our schools being gifted to saviours from the private sector. The PISA tables held little joy for the proponents of free and profit-making schools with Sweden tumbling down the rankings. As for our Secretary of State, PISA statistics tell him to reform harder and faster with a narrower curriculum. Over at Ofsted, Sir Michael recommends reintroducing more external bureaucratic testing for primary and secondary children. 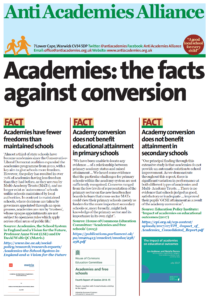 The new round of performance tables will be used by the DfE to bully and coerce schools into academy status. 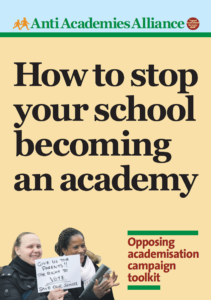 In a welcome and principled stand, Barking & Dagenham Council has said it will ballot parents whenever academy status is proposed. Hope to see you at the Anti Academies Alliance Annual Meeting: Fighting Forced Academies. 1:00-4:00pm on Saturday 25 January 2014 in Central London. 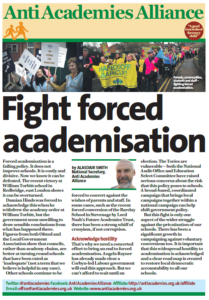 This entry was posted in News, Top story and tagged Consultation, Councils, Forced academisation, Gove. Bookmark the permalink.